When was the last time you got into the driver’s seat of a vehicle that had anticipation engineered right in? The moment you get behind the wheel of the Nissan Pathfinder, you’ll be equipped for any adventure the roads throw your way. Are you ready to take your explorations farther than ever before, and leave “that’s impossible” in the rearview mirror? Choose the Nissan Pathfinder. In the Pathfinder, your travels will only be limited by the number of hours in the day. If you’re looking for the premier dealership of Nissan Pathfinders near Calgary, make Cochrane Nissan your first and only stop! 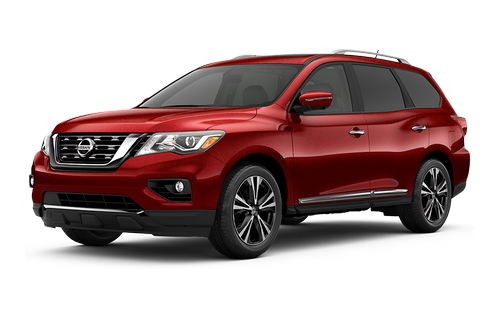 At Cochrane Nissan, we’re proud to provide an incredible variety of Pathfinder models, each equipped with the cool features and convenient technology that help make every trip memorable. Our expert sales team will go through your list of needs and wants, and match you with the Pathfinder that’s got everything you’re looking for — and much more! Your incredible dealership experience doesn’t end on the sales floor, either. After all, we’re known for providing service so good you’ll tell your friends. Whether you’re exploring financing options, ordering parts, or visiting the experts in our Service Department, you’ll discover an unparalleled dedication to your satisfaction. Looking for a Nissan Pathfinder near Calgary? Visit us today! You can find us at 7 River Heights Drive in Cochrane, AB, or call us at 403-851-8585. With our 4-acre lot, you’ll always have plenty of options for your next Nissan Pathfinder! From the comfortable lounge to the digital boards, we’re proud of our fantastic new dealership near Calgary! Get service on your schedule with our Quick Service bays. With its bold road presence and rugged lines, the Nissan Pathfinder doesn’t just turn heads — it causes people to stop and stare! Signature LED running lights give the Pathfinder a distinctive look by day, while available LED low-beam projector headlights help illuminate even the darkest night. Available 20-inch wheels bring the Pathfinder’s good looks down to the ground, while the available Dual Panel Panoramic Moonroof allows you to let a little sunshine in. Become a true standout on the streets in the Nissan Pathfinder. Want to take the “are we there yet?” out of your next road trip? In the Nissan Pathfinder you can, thanks to the available Tri-Zone Entertainment System. While the front seat passengers take in the scenery and enjoy music the way it was meant to be heard through the available Bose Premium Audio System, second-row passengers can watch movies, play video games, and plug in a laptop, all on dual 8-inch screens. With so much entertainment on board, you may find yourself at the destination all too soon! When was the last time a dealership rolled out the red carpet for you? At Cochrane Nissan, that’s business as usual. We’re always striving to find new ways of going the extra kilometre for you. Sales pressure? Not at Cochrane Nissan! We’re proud to provide a better way to get behind the wheel. Whether you’re browsing our incredible inventory of cars, trucks, and SUVs online, taking a stroll on our four-acre lot, exploring financing options, or visiting the trained technicians in our Quick Service bays, you’ll discover a complete dedication to your satisfaction at Cochrane Nissan. And with perks like our digital vehicle customization boards, comfortable customer lounge, and service so good you’ll tell your friends, we’re not just the newest Nissan dealership around – we’re the best, too! Call, click, or stop by today, and discover how much fun shopping for a new Nissan vehicle can be. Went into Cochrane Nissan on Tuesday afternoon to purchase our new 2018 Nissan Qashqai from Bailey Munro and drove it off the lot on Thursday morning! Have to say as their first customer they did an excellent job from the moment I walked in the door. Bailey is a genuinely honest and capable salesman who wants the best for his customers. It seemed that the whole dealership came out to say hi and ask if everything had gone okay from the managers to the owner on Thursday morning pickup. And a nice sound bar for the TV thrown in for good measure…..which sounds great in the living room by the way. Plus their French Vanilla coffee is top notch! Overall the service received was exemplary from start to finish. Thanks everyone! Welcome to Cochrane.